Customer satisfaction: Customer has been the core focus area when it comes to product development in AGILE. Target is to develop a product exactly as per the customer needs, with no extra baggage, with optimal quality and features and in least possible time (and budget). While satisfying customers, it is also essential to take their comments and feedback on the product that is getting shaped for them. It hence becomes extremely essential to involve them in the process of product development as a stakeholder that constantly keeps an eye on the product that is getting shaped and keeps on making recommendations to change / improve. Changing requirements: In AGILE, the focus is on the customers and the product that is being built for him. As the product takes its shape, it becomes visually available to the customer and quite often the customer wants to change his requirements. Also the technology industry and business may evolve which may require changes to the product being developed. Agile incorporates bandwidth for changes and helps in creating an end product as envisioned by the business stakeholders. Frequent delivery: Agile believes in building the software in an iterative manner and in smaller cycles. The target is to build the essential functionalities in the earlier cycles and then move on to the less used ones. Customer takes a call on the prioritization of functionalities. Based upon his requirements he may want to remove a functionality altogether though it may have been present in high level requirements as gathered in the beginning. Work together: Agile teams sit together, at times in a secluded room for no one to disturb them and collaborate towards solving problems one after another. This allows the team to focus on core issues, prioritize and build solutions in the limited time of the sprint time that was made available to them. Even for the cross geography teams, the teams try to collaborate as often as possible on audio / video conference to understand the progress of each other’s work. Trust people: People are trusted and empowered in Agile. This gives a feeling a responsibility amongst them and helps them proceed in task at a faster rate. It also creates a team culture of positivity, team work and collaboration within the team. 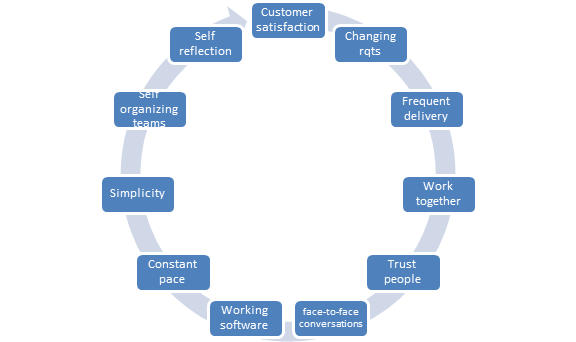 Face-to-face conversations: Agile requires a great culture within the team. Managers try to build a good camaraderie within the team members and face-to-face conversations help a long way to build it. It also further helps in developing trust amongst the team members. In a lot of meetings like daily stand up, sprint review which are core to many key methodologies in Agile, a face-to-face discussion adds a lot of value. Focus on working software: While focusing on customer and its end product, the key point to notice in Agile always go towards creating working software for the customer. Target is to deliver a software with key 2-3 functionalities to the customer right in the first spring so that he can start using the product right after the first sprint. Thus Agile makes working product available to the customer in a short period of 1-4 weeks and that is what makes it a favorite amongst the business community that seeks quick product development. Constant Pace: A constant pace is also targeted and mostly achieved in case of Agile. In traditional models, it was observed that the team used to be comparatively free in the initial part of the cycle and heavily loaded at the end. In Agile however, since the stakeholders are always aware of the progress of the team, time required for any task and time availability with resources realistic targets are set. The team breaks Epics to stories and stories to tasks and then allocates time for those. Moreover since the beginning of the project the team is occupied on completing tasks, stories and epics. Simplicity: Simplicity is the key for Agile projects. The team targets to have simple architecture, designs and codes which help new team members to quickly understand the documents and completed work and allow them to start contributing early in the project. Also simplicity allows the existing team members to grasp things and build code and functionalities faster. Self-organizing teams: Agile teams are self-managed and self-organized. External team managers are usually not required. The team members themselves provide feedback to each other and this feedback mechanism help the team to improvise. Also the team takes care of its developmental needs and takes necessary actions whenever it feels the necessity to learning anything new. Self-reflection: Is one of the most important principles of Agile. Teams self-reflect a lot when it comes to improving themselves, the processes and the tools. This also helps them get better at work and in agile and allow them to deliver a better end product.